Nancy Gedge is a teacher who thinks outside the box. She is also Mum to a young man with Down's syndrome, and as such has a vested interest how best to provide for children with SEND. She writes two fabulous blogs which I urge you to visit; The Diary of a Not So Ordinary Boy centres around parenting a child with Down's syndrome and Class Teaching Tips is written with her educator's hat on. 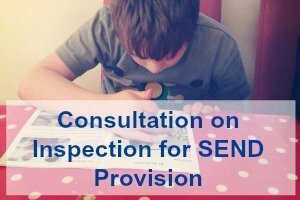 Nancy saw the link for a consultation on inspection for provision for children with Special Educational Needs and Disabilities (SEND) while eating her sandwiches. She decided to postpone responding to the consultation and to put some initial thoughts down on paper (as it were), in case the questions in the consultation don’t quite address her concerns. She didn't want her thinking to become de-railed. 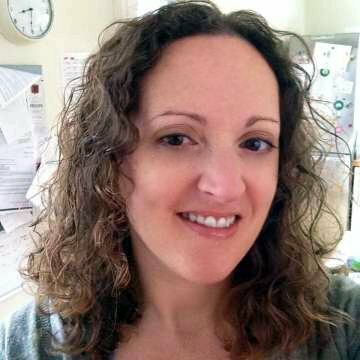 I felt that what she wrote, in the form of an open letter to Sean Harford, Ofsted's National Director, Education - would make very interesting reading for Special Needs Jungle followers; so over to Nancy. If you don’t mind, I’ll get straight to the point. It may seem like a small thing to many people, and there is no doubt that some students with disabilities do need an element of care, but I cannot stress how important it is that, in educational establishments at the very least, care does not form a much of a part in assessment of services, or in the language we use around the subject, except where there is a medical need for that child or young person. The reason is this: while a medical model of disability is used in the diagnosis of an SEND, it is there that its usefulness in terms of provision and expectations pretty much ends – and the excuses begin. What children with SEND need from us is an education so that they can, as much as they are able, become useful and valued members of society, rather than dear weak souls who must be cared for as long as they live. Being kind and caring is very nice, but it doesn’t make one effective. **Amendment** I think it is worth asking the question of people what we mean by care. I am writing about the medical sort, where people are looked after rather than empowered. This is because my son has Down’s syndrome and this is something we have come across. It’s not great. In that case, I would ask that you would ensure that your teams of inspectors are well trained in special education, so that the very last thing that they can be accused of is of patronising either the schools or the children with a ‘poor little dears’ mentality that devalues their judgements. I would suggest, in this endeavour, that your inspectors have some time to familiarise themselves – as well as become inspired by great practice – with the fabulous schools and colleges who are working to change lives and secure futures right now. Identification of SEND is a fraught business, and, as both a parent and a teacher I have a couple of thoughts to add to the mix. As far as a condition like my son’s, Down’s syndrome, is concerned, it is a relatively simple matter to diagnose. An experienced midwife and a quick blood test and you’re done. There is either an extra chromosome or there isn’t. Where the problem lies is in how this diagnosis is communicated to parents, both expectant and very new. Could I suggest that you take some time to look at the work of Hayley Goleniowska on the language that people working in the medical profession use when talking to new or expectant parents. While I appreciate that Ofsted has little to do with medicine, the Education, Health and Care Plan is where the two worlds meet, and this attitude of doom towards disability has really got to change. As far as identification in schools is concerned, I would like you to ensure that teachers (all of them) know that SEND is not directly linked to attainment. I am not convinced that many teachers really understand this (particularly in primary, because I work in that phase) – and autism is a case in point. The *amendment* average age of diagnosis for Asperger’s (that’s people with Autism who function at a high educational level) is 11-12 years old. They have left us in primary, and have joined the secondary school – where their chances of losing the plot and being excluded are much higher. Often, I hear of the reason why a child does not have a diagnosis of whatever learning disability it might be, is that their attainment is not bad enough. Well, what happens when working their little socks off is not going to help them any more? What happens when they can no longer cope? They still have a special educational need/disability. It’s not always about attainment by any means. We seem to have a ‘step in when we are at crisis point’ mentality and this has to change. I would like you to look at firstly how these are communicated to parents. Putting them up on a badly designed local authority website is not good enough. Handing out the odd glossy leaflet is not good enough. Parents of children with SEND are often tired and hassled. Information has a tendency to go in one ear and out of the other. Someone needs to take responsibility for making real relationships and having enough knowledge of what is out there to make sure that the right thing gets to the right person at the right time. At the moment it is far too ad hoc and this has to change. In addition, I would like you to look at where activities and services are happening in relation to where the children and young people actually live. Are they having to drive some distance so that they can access something that is suitable for their needs, or have all methods been employed to ensure that there are quality inclusive options in their area so that they can get together with their typically developing peers in sensitive and creative ways, rather than be herded together, miles away from the communities in which they live, in some sort of ‘Special Needs Club’? If there are inclusive options, I would like you to assess their quality. Saying that everyone is welcome is the first step on the journey but it is not enough. I am not sure that everyone understands this and that there are some providers out there who claim to be inclusive, invite some disabled kids along (preferably the easy (!) ones) and change nothing about what they do – as part of some tick box exercise in order that they can get their funding. This has to change. I would like you to investigate the level of training, knowledge and understanding of SEND in our schools. I’m not convinced that it is very good – and that has to change. Let’s face it, the focus on attainment and progress at all costs isn’t helpful as far as inclusive practice is concerned. Learning needs and disabilities come in many shapes and forms, they aren’t easy to understand, and neither is teaching children with them easy to do. Sometimes it can take a child a long time to get to a place where they are capable of learning. This needs to be explicitly understood by inspectors and good practice celebrated. Otherwise nothing will change. I hope you don’t mind me making this letter an open one – I have a sneaking suspicion that there are lots of other people out there who will read it – and will have something else of value to contribute. If you are reading this and you have a story to tell Mr Harford that will help him in his endeavours to understand the state of provision for children and young people with SEND, please do share with us. Here is the link to the consultation. Want to know what happened next? Nancy has just had a reply and you can read it here. From Julie Thompson via the SNJ Facebook page: Fantastic letter from Nancy Gedge and I’ve just read the reply. I’m happy that Mr Harford has taken Nancy’s concerns on board and he goes to great lengths to assure her that inspections are only carried out by inspectors specialising in SEN. This I find hard to believe – maybe they do this with special schools, but I find it almost impossible to believe when it comes to mainstream. I can count off the top of my head at least 3 mainstream schools within 20 mins of where I live where it would seem, when it comes to SEN, there is much to be done. Now I don’t know much about inspection procedures, etc., etc., but what I can tell you as a parent with a child with SEN and also from talking to other parents with children with SEN whose children attend a mainstream school in my area is this:- there are still far too many mainstream schools out there that quite frankly, couldn’t give a toss. They are more concerned with their league table entry positions. As such, they will put whatever they feel like they can be bothered to put in place for the SEN child, possibly send their staff on an ASD awareness course one day a year, (or not) – after all, theres nothing that says it’s compulsory for their staff to be trained in SEN or even have awareness when it comes to ASD. They will also usually ignore bullying of SEN children in their school, because lets face it, they would rather they were not in their school to begin with. As for identifying children who need an ehc needs assessment and making sure they assist the parent 100% with that request, or even at the very least make sure their IEPs/SEN support reports are issued with TARGETS and OUTCOMES, this really does seem like too much to ask for some mainstream schools. In other words, it’s not about sending in teams of inspectors (specialising in SEN), it’s about asking the right questions from the staff and parents, finding out what kind of culture there is in that school when it comes to SEN, which will involve asking head teachers and SENCO’s uncomfortable questions and then asking them to back it up. Will they do it? I very much doubt we will see a real improvement in this area for many years. Oh, and if Mr Harford would like to come out of his office once in a while and see for himself, I would suggest he starts with his local parent/carer forum and speaks to the parents of children with SEN or failing that, maybe just take a look on Facebook once in a while at the various groups on here and the issues parents have to deal with day in/day out with schools and local authorities that just don’t give a toss when it comes to their SEN child. My children were in a mainstream primary school that ofsted deemed outstanding. Despite this the school were disinterested in my son’s diagnosis (ASD, hyper mobility and learning difficulties) and refused to put in appropriate support. He subsequently developed mental health difficulties and stopped attending school (it took me 5+ years to help him recover and re engage with learning at college). Whilst he was at school I tried to raise my concerns about the schools attitude to SEN with ofsted inspectors but I was ignored. I was made to feel that as a mother my views did not count and/or I couldn’t possibly understand anything relating to education. Funny that considering I was the one who picked up my sons developmental and learning difficulties. The school were clueless. I wish my son had been an isolated case but the same indifference happened to my daughter and also other SEN children in her class. Why was a mainstream school who failed to support and include its SEN children deemed outstanding? In my opinion, based on my experience, the school were more bothered about academic results than equality and inclusion. As for ofsted they were useless, a total waste of time and a government body I cannot rely upon on behalf of my SEN children. Now I make my own judgement based on my own SEN questioning and gut instinct. If ofsted want to improve things for our SEN children then at the very start of this process they should communicate with as many SEN families as possible – hear what we and our children have to say, respect what we have to say and acknowledge that we know more about our children than you. If they can work with us as equal partners then maybe we can improve the educational experiences of children like mine. But if they continue to be arrogant, aloof and preoccupied with academic results then I fear nothing will ever change.